The VA home loans have increased the opportunity for military veterans to become homeowners with 100% financing and affordable VA loan rates. Our VA loan program was established for all veterans and military personnel to qualify for affordable home financing for purchase or refinance options. Existing VA loan customers may qualify for a low rate streamline refinance that could potentially save them thousands of dollars a year. Most veterans are eligible for VA home loans. Surviving spouses are eligible for a VA home financing in most cases. Compare rates on no cost VA loans today! The VA guidelines post underwriting requirements for credit and income standards on VA home loan programs. Typically, VA loans are not as tight as traditional conforming loans and the interest rates are much lower than subprime mortgages. Unlike FHA, there is no mortgage insurance with VA loan programs. VA Purchase Mortgage up to 100% with No Down-Payment! Have mortgage rates declined since you bought your home using a VA loan? Do you have an ARM with your VA home mortgage that you want to refinance into a fixed rate loan? The IRRRL program, also known as the VA Streamlined Refinance program, may help you save money with a lower monthly payment that is fixed for thirty years. In most cases, no appraisal is needed and if you already have a VA loan, the certificate of eligibility is not needed either. Should you try a VA home loan? The VA loan is not actually a loan, but rather government guarantees that protect the lender of loan against loss if the veteran defaults, and provides the lender with the protection they normally receive through requiring a down payment. These loans are made by private lenders such as banks, savings and loan associations, or mortgage companies. The following gives a few comparisons between VA and conventional loans, but finding the right loan requires that you assess your financial circumstances, the price of the home you're buying and other factors. If you need a home loan, you might consider hitting up your Uncle Sam. Department of Veterans Affairs home loans -- VA loans for short -- are a popular option with home buyers. In the past fiscal year alone, the government has guaranteed 300,000 VA loans totaling more than $38 billion. And with good reason. The loans require no down payment and are available from most lenders. In addition, the government limits the amount of closing costs and origination fees lenders can charge, as well as the appraisal fees. In general, the loans are available to some veterans, active service members, reservists and members of the Public Health Service. Refinance your mortgage and get cash out up to 90% of your home's appraised value. Our VA mortgage lenders provide competitive refinancing with options for getting cash back and consolidating adjustable rate loans into a better fixed rate mortgage guaranteed by the VA Administration. Although Veterans can refinance an existing VA mortgage, they will be restricted to 90% if getting cash back in the loan, whether you are consolidating credit card debt or financing new home improvements. If you are active duty military or are a veteran, chances are you already know about your VA eligibility for financing a home loan as authorized by Congress. Veterans searching for a home loan online will find that while there are many benefits to the VA loan, there are also some drawbacks that could make conventional financing a more feasible option for the veteran home buyer. Interest rates are usually very similar between Fannie Mae conventional and typical VA mortgages. But, VA loans are more forgiving on bad credit, offering better rates with VA loans for borrowers with low fico scores and other characteristics preventing them from qualifying for a loan with a prime mortgage broker than what a sub-prime lender would offer through a bad credit mortgage. Many times, there is 100% financing for VA Loans, but some lenders may require a down payment. Closing costs for VA loans are often lower than for other mortgages. VA loans are assumable, and there are no prepayment penalties. Under the Veterans Benefits Act of 2004, the maximum guaranty amount of $60,000, for certain loans in excess of $144,000, to an amount equal to 25 percent of the Freddie Mac conforming loan limit (currently $417,000). So, the maximum VA loan amount with no down payment is $417,000. Any loan above $417,000 is a non-conforming jumbo mortgage. For jumbo home loans, unless you have a 20% down payment, it may be best to consider an 80-20 loan. With a VA loan, if the interest rates dip, you can do a "streamline refinance". A streamline refinance requires no income, asset, or credit verification. It is also much cheaper than a conventional refinance because many of the traditional closing costs are waived. However, VA restricts cash out. Conventional and conforming mortgages are better for cash out. You can get a VA home equity loan for home improvements, debt consolidation or for other purposes. But, the loan limits are generally lower than for conventional home equity loans. And, they generally don't offer 100% or 125% equity loans. Check with your home equity lender for VA home equity lending limits and other restrictions because they vary from state to state. And, the VA does not offer hard money loans. These require a specialized broker because most lenders, including sub-prime lenders, don't make hard money loans. Last two years W-2's, 1099's, etc. Copies of Pay stubs covering one month period. Declaration page of Homeowners Insurance Policy. Copy of a Statement for current Mortgage. Another big benefit to VA home loans -- no private mortgage insurance. Not only does the VA not require PMI, it also prohibits lenders from requiring it, says Bob Finneran, the VA's assistant director for loan policy and valuation. "We're putting a guarantee on the loan, so we're not expecting them to get other insurance and charge the veteran for that," he says. On a $126,000 loan, PMI would run approximately $40 to $64 a month for the first three to five years of a 30-year loan, says Jeff Lubar, spokesman for the Mortgage Insurance Companies of America, an industry trade group. Total savings: $1,440 to $3,840. Rates generally follow the market, just like any other home loan, says Keith Pedigo, the director of loan guaranty services at the VA. "Rates are generally in line with conventional rates," he says. "The advantage of going VA is that you do not have to make a down payment." And, according to VA statistics, 91 percent of VA buyers skip the down payment. There is one down side. Starting in 1982 Congress levied a one-time funding fee on VA loans, says Pedigo. Fees range from 1 1/4 percent to 3 percent, depending on the veteran's service and whether it's a first or subsequent loan. "The typical fee is 2 percent," he says. The VA will lower the fee if the borrower makes a down payment of at least 5 percent. For refinancing loans, the fee ranges from a half percent to 3 percent, with a half-percent being the usual fee, says Pedigo. Many buyers simply finance the fee along with the home. But that can have a hidden cost. On a $126,000 mortgage -- the average amount borrowed last year -- a 2-percent fee can bloom into $14,474 over the 30-year life of a 6-percent loan. The fact that buyers can qualify for a VA loan doesn't mean they should automatically use one, says Tim Doyle, a director in the government affairs office of the Mortgage Bankers Association of America. "Prospective homeowners should still shop around," says Doyle, who recommends that home buyers also evaluate conventional and FHA options. "But if they don't have a down payment and are offered as good an interest rate as what they would get elsewhere, it's a good option." Refinance & Lower your payment! Consolidate Adjustable Interest Rates and Save! ARM vs. Fixed Rate Calculator - How does a VA loan with a fixed mortgage rate compare to an adjustable interest rate? 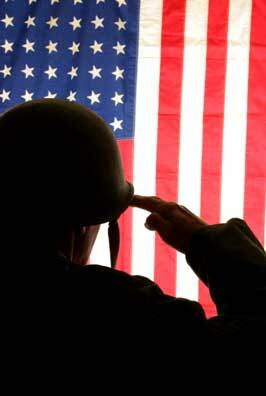 Cash Out Refinancing - The VA extends cash out opportunities to qualified Vets on loans up to 90% loan to value. So if you have 10% equity, you be eligible for a VA loan that offers money back to you when the new mortgage closes. Mortgage for People with Bad Credit - Remember there is no minimum fico requirement on VA loans. The borrower must demonstrate their ability to make their payments monthly, but low credit scores will not eliminate an applicant for qualifying purposes. Please be aware that this is not an advertisement for credit as defined by paragraph 226.24 of regulation Z. Nothing on this site contains an offer to make a specific home loan for any purpose with any specific terms. This is a web-site and no loans can be guaranteed as loans and rates are subject to change. Nationwide is affiliated with national lenders and a federally chartered bank located in Maryland licensed to offer home loans in all 50 states. Copyright © 2001-2010 and Beyond, Nationwide Mortgage Loans - BDnationwidemortgage.com is a website and cannot make loans. All rights reserved. Please note that the Department of Veterans Affairs may change program details on a VA loan.